AB, Rutgers College, 1860; NBTS, 1863. Licensed Clergy, Kingston, 1863; ordained Clergy, Kingston, 1864. 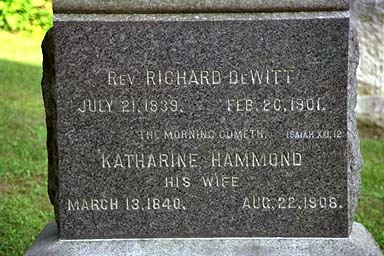 The Reverend Richard DeWitt served as pastor in Guilford Parish, New York (present-day Gardiner; the parish doesn't exist anymore, and the church burned down, but the parsonage may still be standing) from 1864-71; in Spring Valley, New York, from 1871-76; Wallkill, New York, 1877-89; and Flatbush, New York, 1889-1901, where he died (see pictures below). 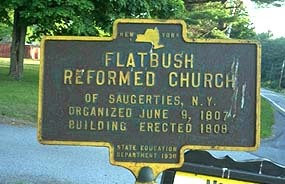 He married his son John Ten Eyck DeWitt to Adaline Veldran in the Flatbush Reformed Church in Saugerties. 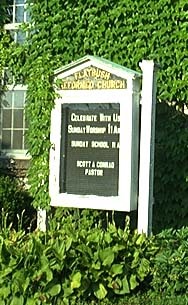 Flatbush Reformed Church, on the back road along the river from Saugerties to Kingston. On a couple of visits, we've run into the current pastor, Scott Conrad, who's a very nice fellow and has been helpful in digging out old records, finding pictures for us of Richard DeWitt and so on. The church has a small historical display just inside the main doors, with old pictures and documents under glass. A picture of Richard hangs on the back wall. 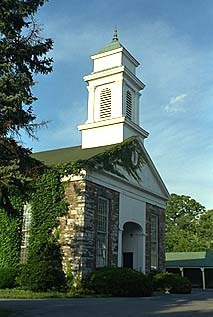 The parsonage, standing on the highway just north of the church. 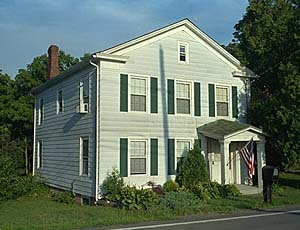 This is the building Richard DeWitt would have been living in when he died. Scott Conrad told us the building used to be larger (and would have been in 1901); a subsequent renovation took off a disused wing to the south. Rev. Conrad had pictures to show us what it looked like back then. 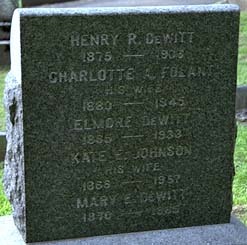 The family marker at Wiltwyck Cemetery in Kingston, New York. The cemetery office has records of who was buried when, cause of death, etc. They've been very nice about making time for us in the past. The front of the family stone. The back of the family stone.